“Mi Buenos Aires Querido”, My beloved Buenos Aires. These are the opening lines of a tango, the heart and soul of Buenos Aires. It describes feelings of love and sorrow, and the dance describes the prowess of the Argentine man. No other city in Latin America compares with Buenos Aires in culture, sophistication and nightlife. It’s a fun place to visit and spend at least three-days basking in the land of the Gauchos, the cowboys of Argentina. 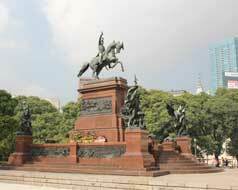 Wide avenues, plazas and pedestrian streets make Buenos Aires a place to be. Side-walk cafes, bars and restaurants line the main arteries of the city. Traveling south is La Boca, a colorful neighborhood where the early Italian immigrants settled. Caminito Street is the main artery of the neighborhood; crowded with street artists who offer their art at excellent prices; while tango dancers and music romp the air of this unique corner of Buenos Aires. Plaza de Mayo is surrounded by the Government palace, called Casa Rosada, the Pink House; and it is painted flamingo pink. May Square is the theater where major events of the political life of Argentina took place, starting with the revolt against the Spaniard colonizers and going through the years of Eva and Juan Peron, the most powerful couple who have ever led Argentina into a social revolution. The La Recoleta district, where infamous and famous – including Eva Peron – are buried in elaborate mausoleums, tells the history of Argentina. Across the street, the Museum of Fine Arts of Buenos Aires exhibits Argentine and European masterpieces. A few miles outside of this eleven million populated city lies the pampas, the cradle of the Gaucho. Today, many of the ranches have opened their doors to tourism. You can spend a glorious day enjoying the outdoor activities of the gauchos in a typical working estancia or ranch. An open pit barbecue with delicious meats will be roasting as you participate in horseback riding, biking or hiking around the ranch.